AMD is today announcing its most powerful desktop CPUs ever - 2nd Generation Ryzen Threadripper. Soon to be available in four models, these new Threadrippers extend the single-socket reach from the present 16 cores to up to 32 cores. What's new is the way AMD now differentiates these CPUs, because they are to be referenced as either X- or WX-series. The AMD-provided slide sheds high-level details. The 2920X and 2950X are the effective replacements for the incumbent 1920X and 1950X, albeit clocked in at higher speeds and imbued with some behind-the-scenes technology we cannot divulge today. Core counts and threads remain the same, but understand there is no immediate eight-core replacement in the works. 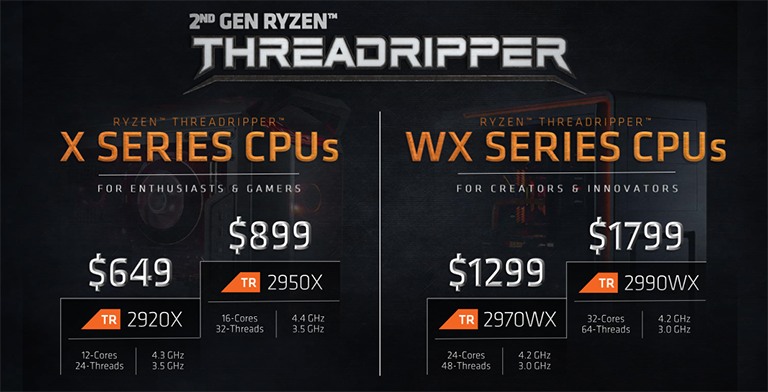 Stepping it up a notch, and to levels not before seen on consumer AMD CPUs, 2nd Gen Ryzen Threadripper extends the core and thread counts to 24/48 and 32/64 for the 2970WX and 2990WX, respectively. Note the WX suffix for these headline CPUs. AMD has taken deliberate care in aiming the pair at the burgeoning workstation market populated by high-end Intel Core and mid-spec Xeon processors. Appreciating that the X-series is more of a known quantity, let's focus on what AMD has to say about WX. The first nugget of improvement arrives in the form of TR2 using the same 12nm Zen+ architecture and 2nd Gen Ryzen features present on other recent processors. This means, one would assume, a higher frequency curve, Precision Boost 2 to maximise speed across all cores, and general latency improvements. Of equal importance is the last feature: Socket TR4 compatibility. AMD says the 2nd Gen Ryzen Threadrippers will work on all present X399 motherboards via a BIOS update. That's good news if you have invested in the high-end ecosystem already. Inferring how AMD has built the 32-core part is straightforward enough. One needs to have a look at how AMD has architected the Epyc 7601, for example, for clues about the design provenance. Epyc and TR2 remain different animals due to I/O, memory support and socket provision. Back on point, TR2's speeds are pretty impressive given the core count, too. The two big-core chips share base/boost speeds of 3.0GHz/4.2GHz, respectively, and understanding how Precision Boost 2 works, actual application frequency depends upon the quality of cooling. It would be reasonable to assume that these processors can run at around 3.3GHz on all cores and threads with heavy-duty air cooling. And heavy duty is the key, as the WX parts are both equipped with a healthy 250W TDP. 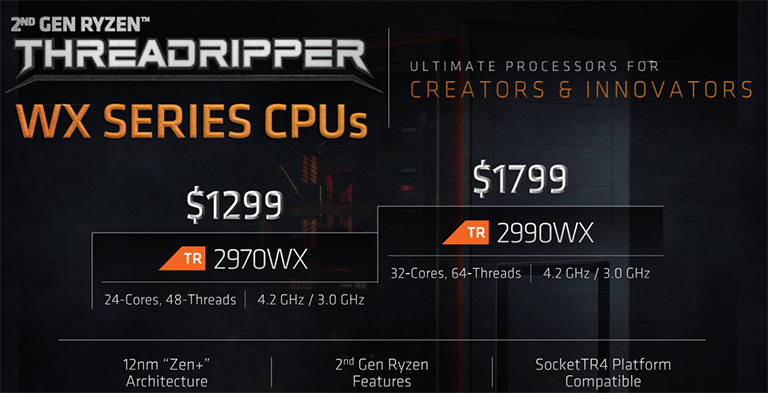 How does all this potentially play out in the ultra-high-end stakes is an interesting question, which was partially answered by AMD's Jim Anderson during the recent Threadripper 2 tech event in Maranello, Italy. Looking at content creation, the premier 2990WX chip is reckoned to be in a whole different multi-core league to any other consumer chip. We can actually guesstimate performance by looking at our 7980XE's review. Such understanding puts the 2990WX at around 5,000 marks in Cinebench and a completion time in around 100 seconds for Blender. Impressive. Those improvements may not sound like much in the grand scheme of things, but if you extrapolate out for projects that take 24 hours to render, a lack of processing time equates to money for digital creation agencies. So is it worth the $1,799 asking fee? That depends upon how responsive your application is to cores, and just how important time is to the overall TCO equation. 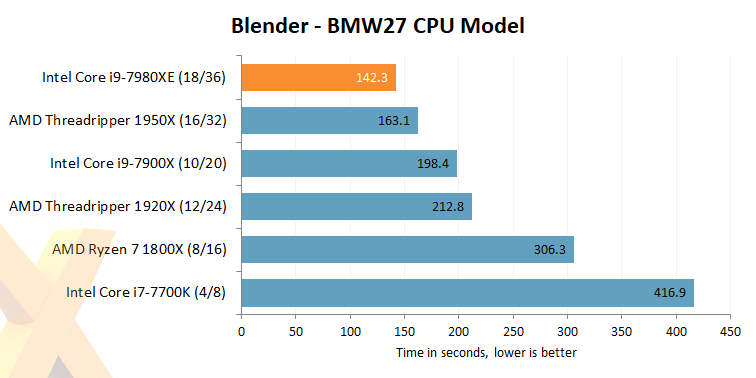 64 Zen threads humming along at, say, 3.3GHz are going to do some serious damage to most CPU-centric benchmarks. Changing gears and going back to the 180W TDP X-series, a similar tale is presented for the 2950X, compared favourably here against the more expensive Core i9-7900X. 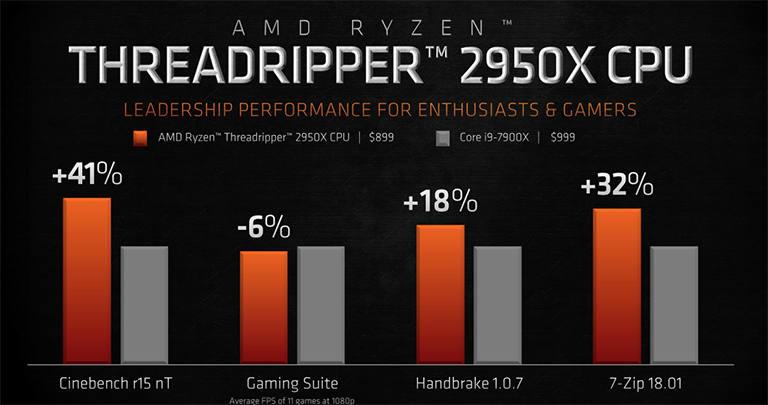 Point is, AMD reckons it has CPU-centric performance hegemony over Intel at all price points. General availability is staggered, with the 2990WX on-shelf and shipping on August 13, 2950X on August 31, and the 2970WX and 2920X slated for October. What we don't know, officially at least, is the under load, temperatures, gaming performance on the 2990WX - game mode or regular mode - and the exact technology driving the 24-core and 32-core models - for example. 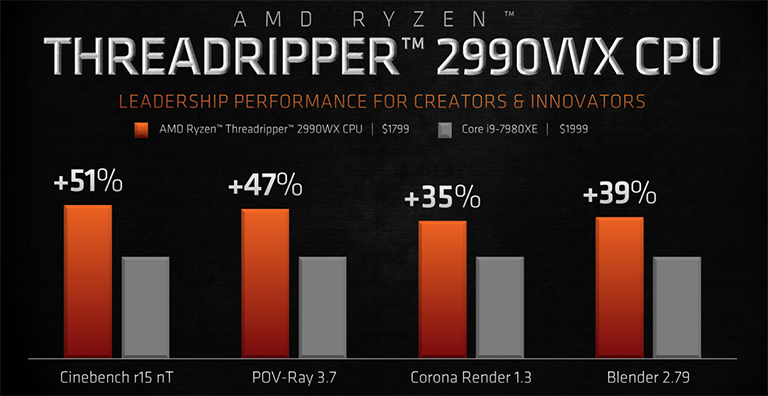 That said, it's clear that AMD is hitting Intel's lucrative workstation market hard. We will know exactly how it plays out in a week's time - hint, hint - but if you want to see the 2990WX in the flesh, so to speak, head on over to the next page.